Summer was a long time in the waiting this year, so when it finally showed up (just 2 weeks ago for us), we've taken full advantage. We can't get enough sunshine and outdoors which has loads of advantages. Instead of stickers, forts and storytime (how we survived a long winter! ), we're kicking balls, jumping sprinklers and riding bikes. Let's talk bikes because that's one of the first big purchases in the world of toddler and I found the perfect one. 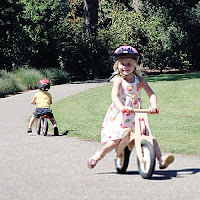 It's eco-friendly and the ideal starter bike for ages 2-5. 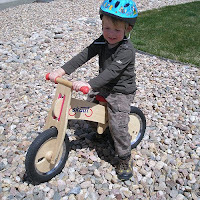 Skuut teaches balance, steering and coordination making that transition to "regular bike" when the time is right so simple and nearly fearless. It's wooden, simple and modern without all the bells and whistles. No pedals, no training wheels.. just a lot of "skuuting" on a fully adjustable seat for easy transitions. 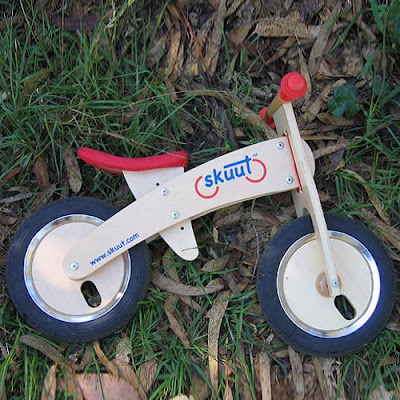 "Walk it; ride it; skuut it; glide it." (We're still practicing indoors.) Available here for only $89.99. Extra Goodness: Tangled and True readers receive 10% off using code tnt081 in the promotional code box at checkout. too kewl. i need one of these for my son! Where do you put in the discount code? I didn't find anyplace to do that. . and we are excited to order this! we saw these all over while living in Germany and were amazed at how easy the littlest ones could learn to balance and ride them! I saw one of these at my local farmers market this weekend, and I was all like, "Hey, I just saw that on Tangled and True"...of course my friend looked at me all funny. Anyway, I may have to pick one up for the little G for next summer! I just ordered one for my little man for his upcoming birthday, he is turning two. I think he is going to love it! !